I just can't get enough of SCP's current auction of Baseball memorabilia. It's filled with a ton of Dodger related collectibles. Over the past several weeks I've shared a vintage Dodger red cap, Duke Snider's testy letter to Buzzie Bavasi and a large grouping of 1956 Dodgers' Tour of Japan contracts. Now, I share an item found within the estate collection of Tony Gwynn. 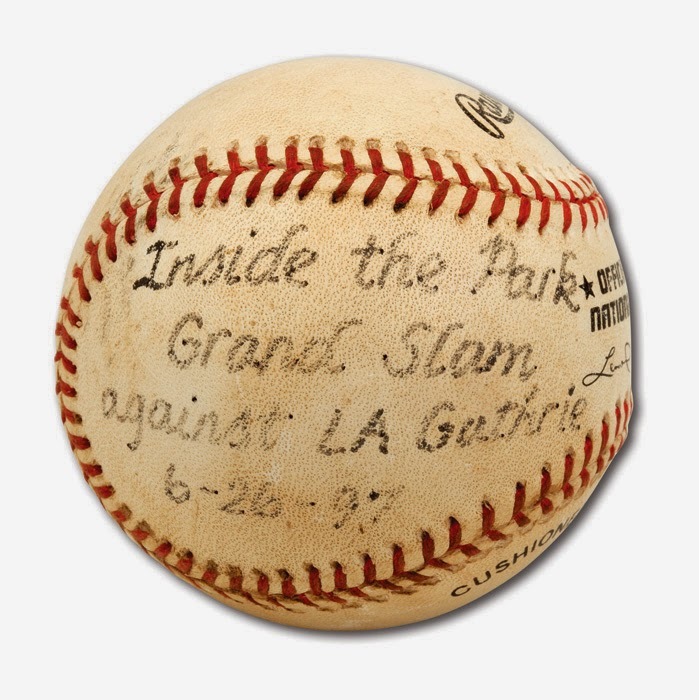 Featured above is the game-used Baseball Gwynn hit for an inside-the-park grand slam against us on June 26, 1997. That's right folks, the man who was a bit large during the twilight of his career (but rather fit in 1997) accomplished the rare feat in the seventh inning of an 4-4 deadlocked game at Dodger Stadium. Watch it below (the highlight begins at about the :20 mark). You can check out the auction item here.